The San Rafael Swell is a large geologic feature located in south-central Utah, about 30 miles west of Green River, Utah. Download free directions, maps, GPS and photo advice for the Ochre Cave Pictograph Panel by selecting the Maps and Directions tab above. The San Rafael Swell is a large geologic feature located in south-central Utah, USA about 30 miles (50 km) west of Green River, Utah. The San Rafael Swell, approximately 75 miles (121 km) by 40 miles (64 km), consists of a giant dome-shaped anticline of sandstone, shale, and limestone that was pushed up during the Paleocene Laramide Orogeny 60-40 million years ago. Interstate 70 divides the Swell into northern and southern sections, and provides the only paved road access to the region. The swell lies entirely within Emery County. The northern Swell is drained mainly by the San Rafael River, while the southern Swell is drained mainly by Muddy Creek which eventually joins the Fremont River to become Dirty Devil River northeast of Hanksville, Utah. The Dirty Devil River flows southward into the Colorado River, while the San Rafael River joins the Green River before it also flows into the Colorado. Muddy Creek cuts into the western edge of the Swell, exits at Muddy Creek Gorge, and then flows across the Blue Hills Badlands near Caineville to its confluence with the Fremont River. Ochre Cave Panel Driving Directions To Trailhead: from I-70, Take exit 149 for UT-24 W toward Hanksville. Turn left onto UT-24 W/​4 Corners Mine Rd/​Co Rd 1029 continue to follow UT-24 W for 24 miles. Turn right onto Temple Mt Rd and continue straight for 6 miles. Make a left onto Goblin Valley Road and go .3 miles. There will be a few short dirt road that led to the edge of the canyon. 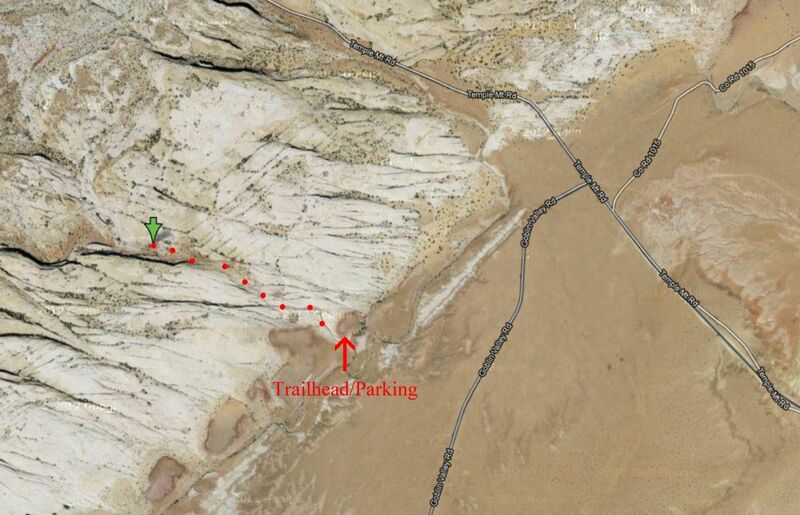 The 2-4th dirt roads all follow the edge of the canyon to several parking areas that allow access to the trails below. For Google Maps driving directions to the Ochre Cave Panel click the green "View Map" icon and then select "Get Directions" in the upper left hand corner of Google Maps. 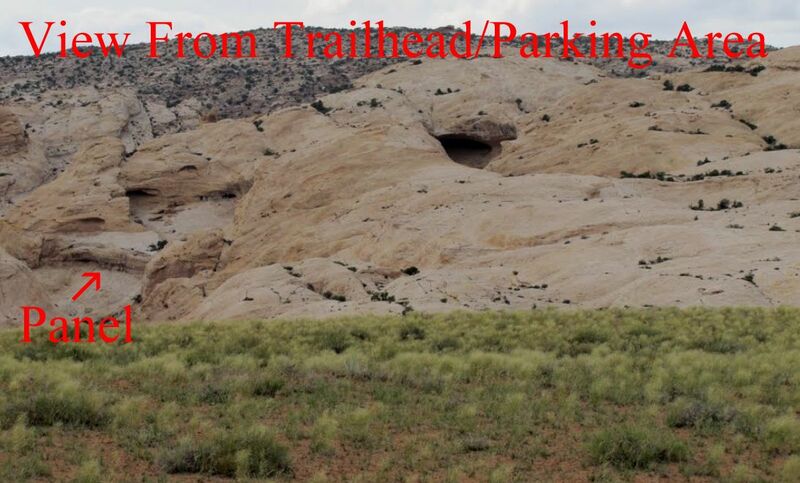 The simplest way to know if you are in the right parking area is to look straight across the canyon and see a series of alcove/caves you are in the right area. The provided pictures shows the view and the arrow on the photo marks the alcove where the pictograph panel is located. From the unmarked trailhead follow the trail to the bottom of the canyon (.2miles.) The easiest way to the panel is to stay high and to the right on the slick rock rather than walking through the sandy wash (1 miles.) Once you have reached the area where you have to hike down to the sandy wash the panel is a few hundred yards ahead on the right hand side in a alcove located about 100 feet up. Access to the alcove is rather easy. The best time to photograph the panel is early am and early evening. Photograph Info: Nikon D3x 14-24mm Lens @ 21mm f11@ 1/13 second ISO 100 Exposure Value -0.3 4/5/12 2:50 p.m.
Download a free copy of the Four Factors of Filter Highlight Photography in PDF format by selecting the “ebook download” tab above. This 37 page guide covers how to take a single image and apply minor manipulations that will help you produce consistent reproducible results. You will also learn the processes of camera set-up, image editing, and advance scouting techniques used by professional photographer Christian James. Free park maps, tide reports, ebooks and additional information can be found under the Maps and Resource tab located in the black bar at the top of the screen.